Chihuahua ears according to AKC breed standard calls for prick (up) ears, but pure bred Chihuahuas can have floppy ears. Some say; “if they are not up by the time the chi is six months old, they will never go up”. I disagree with this statement; while it may be true with some, the pictures on this page show the progression of ear positions in one of my own Chi babies. In the first picture Dandy was 2 months, then 6 months and finally both up at 10 months. Chihuahua ears can go up and down throughout the time they are teething. While your Chihuahua puppy is teething, do not be surprised if you see their ears droop. You may see the tip of one ear bend forward one day and then the other on the next day. This is quite normal. Just like a human baby will drool while they are teething, Chihuahua's ears show the teething stage in puppies. 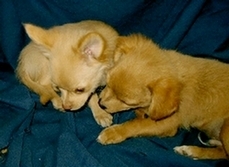 I have also found that the ears of a Long hair Chihuahua seem to take longer to stand than do their Short haired litter mates this picture was taken at 8 weeks old. There are various techniques that may help them stand, but they don't always work. Some even say that; "if they stand from intervention, they were probably going to stand anyway". Some ways that are listed out there that help them stand are, taping them up for awhile, extra calcium to help build the cartilage, massaging them, etc. If this is a major concern for you, research any method listed before you try it. While it may be true some ears will never go up (called broken down ears) this does not make your droopy eared Chihuahua any the less purebred. Yes for the show arena they are supposed to be up....they are supposed to weigh under 6 lbs, they are supposed to be perfect. For me, mine are perfectly loveable with ears up or down.